CHEREAU - Constantinople ville de Romanie et capitale de l'Empire des Turcs. CHEREAU, J. / AVELINE, P.A. - Constantinople ville de Romanie et capitale de l'Empire des Turcs. Constantinople ville de Romanie et capitale de l'Empire des Turcs. - CHEREAU, J. / AVELINE, P.A. Title : Constantinople ville de Romanie et capitale de l'Empire des Turcs..
Map maker : CHEREAU, J. / AVELINE, P.A.. Size : 13.4 x 20.0 inches. / 34.0 x 50.9 cm. 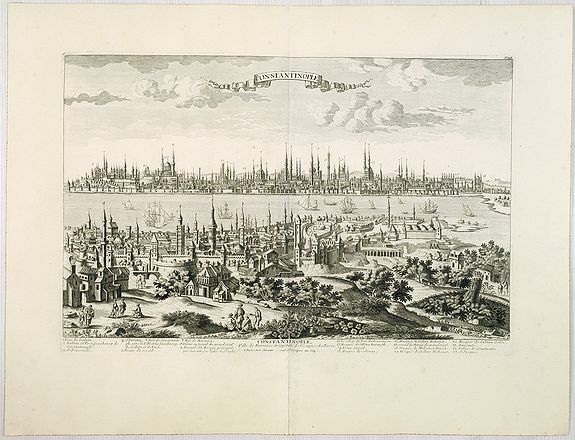 Description :A very decorative and extremely rare town-view of Istanbul, including a numbered legend in lower part. Published by Jacques Chéreau, (1688 - 1776). Engraved by Aveline and first published in 1692 by Crepy, here the rare Jacques Chereau re-issue, with a re-worked plate, of ca.1750. With " fait par Aveline avec privile´ge du Roy" and plate number "92" added in upper right margin. The brothers Chéreau, where one of the most prolific print publishers active in Paris at "rue st.Jacques au Grand St.Remy". François Chéreau was born in 1680 in Blois, it is unknown when he settled in Paris. He was student of Gérard Audran and Pierre Drevet. In 1718 he acquired the stock of copperplates and prints of his tutor Gérard Audran. He was a very talented engraver. After his death in 1729 the copperplates were sold by his widow. His brother Jacques (le jeune) (1688-1776) was also engraver and publisher and worked for one year in England. He was well known as engraver of portraits. Condition : A larger paper copy (495x645mm.) in very fine to mint condition.